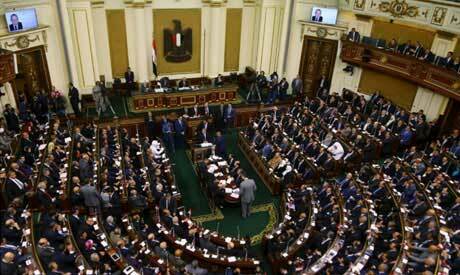 Egypt's parliament, the House of Representatives, will hold a plenary session on Tuesday to take a final vote on proposed amendments to Egypt's 2014 constitution. "We should be as early as possible to have enough time to review the amendments," said Abdel-Aal, adding that "three meetings will be held throughout the day to review, discuss and take a vote on the amendments." Ahram Online has obtained a copy of the final drafts of the proposed constitutional amendments, which aim to change 14 articles as well as introduce two new articles to Egypt's 2014 constitution. (3) Article 140 (first paragraph): The president of the republic shall be elected for six (instead of four) years, beginning on the day after the end of his predecessor's term, and he/she cannot remain in office for more than two consecutive terms. A higher council for judicial authorities will be created and the president of the republic will be its head. The council will take charge of discussing the affairs of judicial authorities. In case of the president's absence, a head of a judicial authority will be delegated by the president to consider the conditions of appointing members of judicial authorities and their promotion, and he will be consulted on laws regulating their business. (9) Article 189 (second paragraph): A prosecutor-general, who will be the head of the prosecution-general authority, will be named by the president of the republic from among three candidates to be nominated by the Higher Council for Judicial Authorities. The prosecutor general's term in office will be four years. (9) Article 193 (third paragraph): The head of the Supreme Constitutional Court will be named by the president of the republic from among the court's most senior deputy heads. The panel of the court's commissioners will be also named by the president only upon a recommendation from the court's chairman and after taking the opinion of the court's general assembly, and in line with the law regulating this matter. (10) Article 200 (first paragraph): The Armed Forces is the people's arm, and its job is to protect the country, safeguard its security and the integrity of its land, preserve the constitution and democracy, maintain the basic pillars of the state and its civilian nature, and uphold the gains of the people, and the rights and freedoms of individuals. The state will be exclusively authorised to create such forces, and any other individuals, authorities, or groups will be banned from forming military or semi-military organisations and militias. The constitution's articles 141, 144, 145, 148, and 173 will govern this matter. The Senate will be consulted on proposed amendments to the constitution; laws stipulated by the constitution; five-year socio-economic development plans; peace and alliance and sovereignty agreements; and laws and all foreign issues to be referred by the president and related to the state's general policies and its foreign and Arab relations. The Senate shall comprise 180 members, and its term will be five years. A third of the Senate's members shall be elected in a secret ballot, and a third will be appointed by the president. The election of the members of the Senate will be governed by the law in this respect. The individual candidacy or the list system, or a mix of the two, can be used in electing the Senate's members.